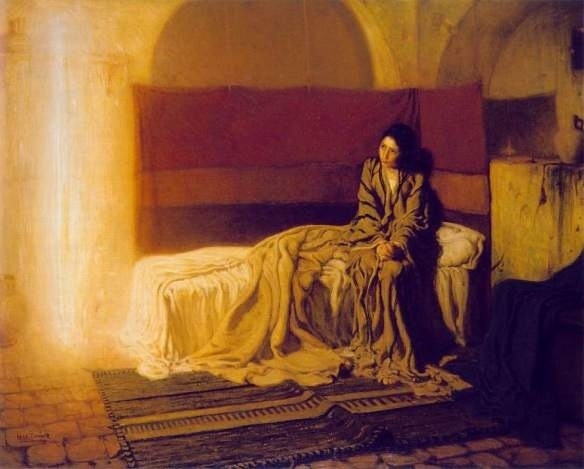 ‘The Annunciation’ by Henry Ossawa Tanner, 1898. He came within our world, and the world would never be the same. In an angelic announcement the proposal was made that would forever unite God and man, reclaiming a radical union. Her womb became His first earthly home; His heart beat with her heart, her love would be multiplied and returned to us beneath the Cross. The Incarnation stands as a pivotal event in the history of redemption. To ponder its value is to consider the radical humility of God, who literally descended to our level to allow us to ascend to Him both in desire and in actual response. This possibility continues to effect its power on the modern world. To deny it, is to stand apart from the wellspring of goodness that generates the life of the soul. In the light of eternity, the Maiden’s ‘Fiat’ is the standard by which human history will be judged, and His descent, the point of departure by which every ‘yes’ ever uttered gains the grace to effect the plan of redemption. One ‘yes.’ All was then forever changed, and truly, nothing would again be casual and small. And put her back before the world’s beginning? Her eyes filled slowly with the morning glow. Her drowsy ear drank in a first sweet dubious bird. Pushing her fears apart, went softly home. Had bowed her head to hide her human tears. Little and terrifying in her laboring womb. The silhouetted pitcher waiting to be filled.